During September and October each year, OPI joins forces with the National Breast Cancer Foundation in which they donate 100% of the profits from the sale of a limited edition pink polish to the Foundation. This is OPI's 7th year as silver sponsors and they've brought out a shimmering Pink Shatter! Today I have swatches and my review for you. I apologise in advance for my very crappy swatches! "The revolutionary new Pink Ribbon Shatter is a texturing treatment formula that transforms as it dries on your nails. When applied, OPI's Pink Shatter begins to shatter and disappear, leaving behind a shattered effect in matte within minutes of it being applied onto an OPI lacquer shade. For a high gloss finish, seal the shatter effect by applying another coat of OPI top coat." OPI Pink Shatter looks quite red in the bottle and in my swatches but on the nail it's definitely pink. It has a hint of shimmer through it which is so gorgeous! My pictures don't do it justice. 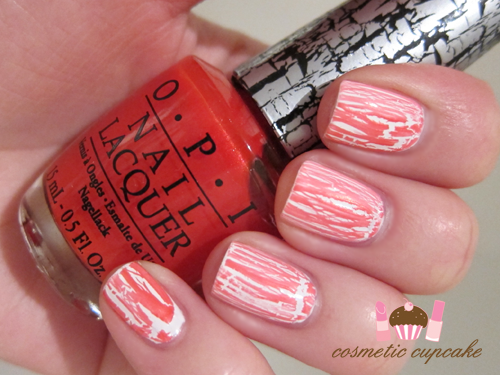 Here I've used one coat of Pink Shatter over 2 coats of OPI Alpine Snow. Overall: Pink Shatter is a gorgeous addition to the OPI Shatter family and very fitting for Breast Cancer Awareness month! The shimmer isn't visible in my pictures but in real life it gives it a little extra something. Unfortunately I had real difficulties with the application making it a very difficult polish for me to apply. The formula is very thin and it shattered inconsistently even during the same use. For example, in my above pictures you can see that the shatter effect is very different on both hands. The shatter effect on my left hand (last pic) is all vertical whereas the shatter on my right hand is more of the usual shatter effect. I ensured that my base colour was completely dry before applying Pink Shatter and I applied it with varying degrees of thickness however it just would not work properly for me like the other Shatters I have. I attempted on more than 3 occasions to swatch Pink Shatter and this was the most successful attempt. Other reviews I've read have not had the same issues I've experienced so I hope it's my bottle and me that is a bit wonky! I really enjoy the colour and the fact that 100% of profits from the sale of OPI Pink Shatter go towards helping fund research programs into the prevention and cure of breast cancer that affect so many woman across the globe. Details: OPI Pink Ribbon Shatter is available throughout October at David Jones stores, selected beauty salons and spas nationally for $19.95. 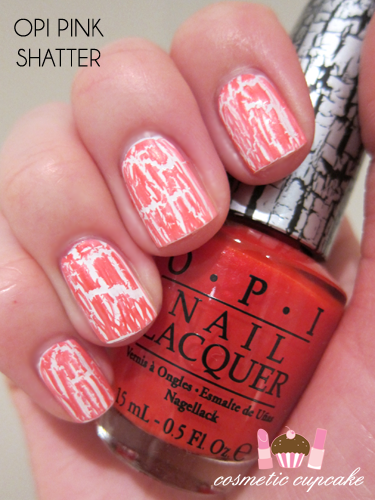 Have you tried OPI Pink Shatter? Thanks for looking as always! The product featured in this post was sent to me for consideration but this in no way influenced my review in any way. As always, my reviews are my 100% honest opinion. My Disclosure Policy can be viewed here. I have used Beautyuk shatter. 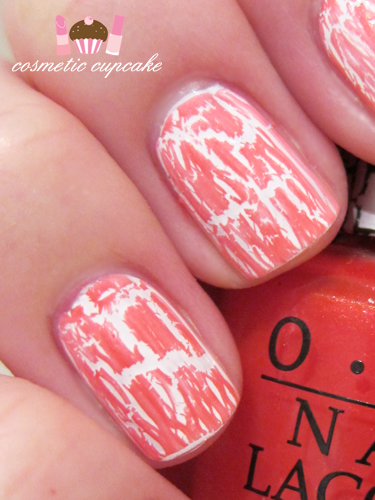 But I think OPI has a better crackle look. I was never a big fan of shatter polishes but this is gorgeous! I love it on you! :) Thanks for the swatch! I was a bit iffy about the colour in the bottle but it looks gorgeous on your nails. Very summer-y I must say! @Amy: It's a gorgeous pink isn't it! Unfortunately I find Shatter/crackle polishes can be a bit tempermental sometimes =( Some days it works so well and others I just can't get it right! @Shang J: Unfortunately I haven't had a chance to try Beautyuk shatters so I can't compare! @somethingdays: How strange! I'm glad to hear I'm not the only one who had this issue but it probably does have to do with the user xp I really like it too despite the trouble with application! @Wan: Awwww thank you Wan! Very kind of you to say that when my swatches are so bad x( It looked better in real life! @Jen: I know lots of people are over the shatter/crackle trend of never liked it in the first place but I think it's pretty awesome. It jazzes up a mani so well! It would be a great shatter polish to start off with! It's a cute colour and best of all for a good cause =) I'd be interested to hear your experience with it - hopefully you won't get the weird shattering!